In the beginning, we were pulling our hair out trying to figure out a logical way for WPML users to be able easily translate their custom homepage layouts, and that’s when it dawned on us to tackle the issue from the perspective of the Theme Options and not the Layout Builder itself. In using the Layout Builder for your homepage, we’ll outline a theoretical approach you could take in this article. 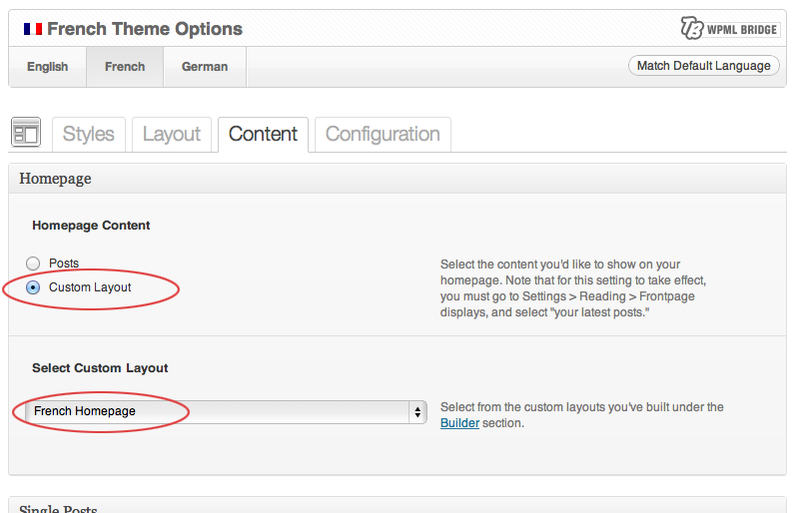 First off, you’d need to create a separate homepage custom layout for each language. These can be as close to each other or as different as you want. This also gives you the chance to incorporate different theme elements that are not created based on WPML languages like sliders and floating widget areas. Then, from your Appearance > Theme Options, you’d set each homepage layout to correspond to each WPML language.